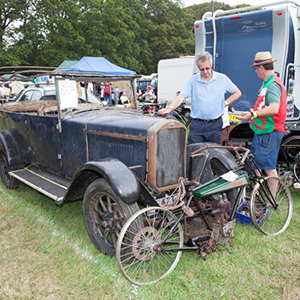 There are just three weeks to go until visitors from all over Europe descend on Beaulieu’s event fields for the 49th annual International Autojumble, on the 5th and 6th September. All the regular features of the Beaulieu Autojumble will be present, including over 2,000 stands bursting with all kinds of motoring bargains. The Dealermart will have up to 100 classic cars for sale while the Automart will have its usual eclectic collection of vehicles, from restoration projects to cars in concours condition. Bonhams popular auction of collectors’ cars and motorcycles is a Saturday highlight and Sunday Trunk Traders will bring an injection of new stock to the fields. Following another exceptional sale last year, this year’s Bonhams auction will once again offer the full spectrum of motoring from the past 100 years. Pre-war highlights of the sale include a 1902 Flint Roadster with a guide price of £22,000-£25,000, a desirable 1928 Armstrong Siddeley Shooting Brake expected to fetch £60,000-£80,000, a 1934 Sunbeam 25, estimated at £25000-£30,000 and a renovation project 1933 Lagonda 3 Litre at £10,000-£20,000. Further highlights include a vintage Bentley 41/2 that gathered dust in a family’s barn for 30 years. The Bentley was built in 1929 and six years later bought by the grandfather of the current owner. He took the saloon on holidays around the UK, even towing a caravan. In 1985 it was taken off the road and parked in a barn in Surrey. The owner thought it would be worth £30,000 but the motor is actually ‘one of the finds of the decade’ and has a guide price of £150,000 – £250,000. Also going under the hammer is the late Lord Attenborough’s prized Rolls Royce Corniche with its distinctive number plate, RA111. It is expected to fetch up to £15,000. Bonhams is also offering, for the first time, a free valuation service for automobilia lots to be considered for future auctions. This service will be available during show opening hours on both Saturday and Sunday in the Bonhams area. Show media sponsors, Practical Classics will have lots to keep visitors entertained at the event in their workshop tent. Editor, Danny Hopkins says: “This year we’ll be at Beaulieu with a mystery project car to be completed – and driven under its own power – by the end of the weekend.” Also on the stand will be the magazine’s Austin Westminster Estate which will be entering the re-fitting phase of its restoration. Visitors to the stand can talk classic cars with the experts and take advantage of a special show offer on subscriptions. Another show sponsor, New Forest based Ringwood Brewery will be open for business throughout the show at their bar in the event fields and at their merchandising stand and sampling area by the Brabazon Restaurant. Do go and sample one of the award-winning craft ales they have been producing at their brewery on the edge of the New Forest, since 1978. A free shuttle bus will be operating on Saturday and Sunday, running continuously between Brockenhurst train station and the Beaulieu Coach Park, starting from Brockenhurst at 8am with the last bus leaving Beaulieu at 6pm. This service is subject to availability and will operate on a first come, first served basis. As in previous years, there will also be a free bus service running to the car parks from the front of the Main Entrance Hall, plus a free delivery service to collection depots in the main car parks for large or heavy items bought at the autojumble. There will also be a Bureau de Change and banking service operating in the event fields on both days. For overseas visitors, several ferry companies are offering discounts on travel to the International Autojumble. Stena Line is offering a 10% discount on crossings from Ireland and Brittany Ferries a 10% discount on crossings from France. DFDS Seaways is offering a 10% discount on a return journey from Dunkerque to Dover and Calais to Dover. Visit www.internationalautojumble.co.uk for the discount codes. Admission to Beaulieu on both days will be from 8.30am, when programmes will be available to purchase and visitors will be able to access the National Motor Museum, toilets, and Brabazon Restaurant, where breakfast will be served. The event will open from 10am – 5pm on Saturday, and from 9.30am – 4.30pm on Sunday. On the day inclusive ticket prices are one day Adult £14.90 (Sat) £13.20 (Sun), one day Child £9.20 (Sat) and £9.00 (Sun), less if purchased in advance online at www.internationalautojumble.co.uk or by telephone on 01590 612888 before 5th September. Early bird tickets at one day Adult £12.70 and Child £8.50, are available until 31st August. Admission gives entry to the whole Beaulieu attraction, including the National Motor Museum, World of Top Gear, Beaulieu Abbey and Palace House and gardens. For more information, visit www.internationalautojumble.co.uk.